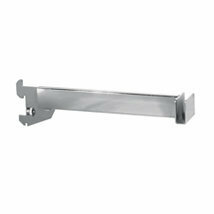 These rectangular hang rail brackets allow hang rails to be attached to 1 in. slotted standards. Use with rectangular hang rails sold separately (search rectangular hang rails).